opposition UPND president Hakainde Hichilema. 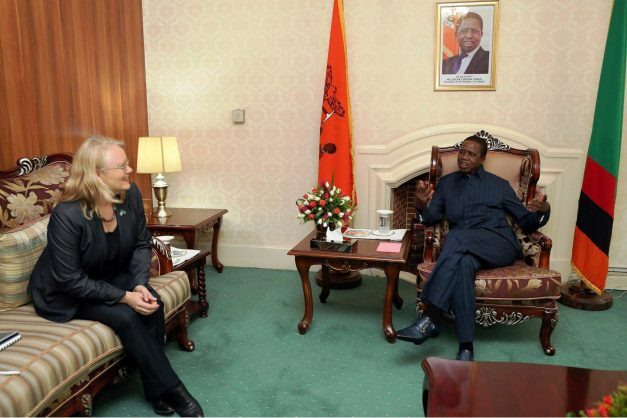 Edwin Sakala who says he is a Chairman of National Opposition Parties and Zambia Direct Democracy Movement Party President says the letter from HH requesting for recalling of UN Coordinator Janet Rogan from Zambia. Below is the letter Sakala who is also a stooge supporter of President Lungu wrote to the UN Secretary General. RE PLEASE IGNORE RECALL REQUEST OF YOUR REPRESENTATIVE IN ZAMBIA MADE BY OUR LOCAL TRIBAL AND ALMAGEDDON PARTY. On behalf of the National Opposition Alliance of ten political parties in Zambia, my own party ZDDM and indeed the majority population of peace loving Zambians we write to ask you to ignore with contempt the allegations being made by one of the local political parties called United National Party for Development- UPND and its letter asking you to recall your United Nations Representative in Zambia Janet Rogan. The UPND Opposition party is on a war path attacking everyone who tries to speak sense to them and the attack on Your representative is a mere strategy to attract international media attention. Your Excellency, the leader of this foreign funded opposition party is a bitter man and failing to work with other political parties after losing elections five times in a role because of his parties tribal character and violent nature. The mans desperation is worsened by the fact that he is aware that there is no chance of him even winning the next election because most of its members have lost confidence in him and the fact that some members are against the tribal tag which he is trying to capitalize on. Hakainde was and some of his members were very sure of winning the last election and even told the nation in advance that they were not going to accept another loss and that they would create an Armageddon in Zambia if they lost. True to their word Hakainde and some of his members who share this bitterness and tmembers on payroll are doing everything to fan tribal based chaos in Zambia and to dent the image of the country internationally. Apart from engaging you and the Commonwealth it has joined forces with regime change opposition parties in South Africa and Zimbabwe. You can use any means a valuable to Your Excellency to confirm that Zambia is one of the most peaceful countries on the African continent in spite of being affected by the global economic meltdown. We are also happy that it has a very popular and democratic government which has continued to tolerate and absolve the insults and fake allegations aimed at creating chaos in the nation. 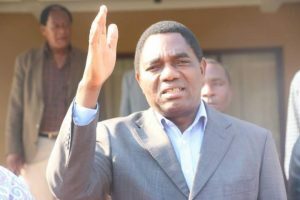 It is in national interest that apart from asking you to ignore this request aimed at alarming the international community that we are also writing to our republican President Edgar Changwa Lungu to appoint a commission of enquiry to investigate the financial scandals involving the leader of this party Hichilema Hakainde and the source of the billions of US Dollars in his offshore account being used in his attempt to destabilize our peaceful country-Zambia. In addition to this we are also asking the President to establish the parentage of the UPND leader because some of the people around him have dual nationality and we have reasons to believe that he is not even a Zambian because Zambians are God fearing and very peace loving people. Some of us who tried to associate with him in the past failed to work with him because of the tribal and violent nature of his party. As Christians we could not stand Antichrist character of his party. As we write this letter there is a report of his members attacking an innocent woman for being assumed to belong to another party. Your Excellency, Zambia will be going for elections in 2021 but it is clear that UPND is trying by all means to get power by other means because they know that the people of Zambia will not give their tribal and violent party their vote. As a party we are campaigning for Federalism to ensure that every one of the 73 tribes participates equally in the national development initiated by the current government. 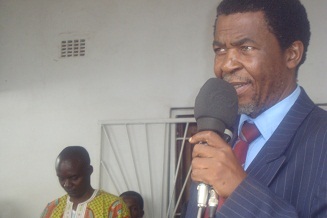 It is our prayer that you will ignore the letter from Hichilema’s party and monitor their activities because the leaders of this violent and tribal party are not only compromising peace in Zambia but possible candidates for the International Criminal Court in the Hague for the crimes perpetuated such as attacking and burning homes of innocent citizens in an area called Namwala. As we approach by elections we know that they will commit more crimes against humanity in their desperation for a short cut into power. Edwin Sakala, you are just an idiot. I am glad and agree with this article which has been written by sakala to the United nations to counteract the most crazy and childish letter written to the united nations by HH.I was simply astounded by pettiness of this man HH.When is HH going to graduate from under 5?God help him and his followers who seem like a bunch of school children playing in the sand.Now your childishness and pettiness has taken you to the united nations. Thank you Mr Sakala and company for taking interest and time to put Mr HH where he belongs.I believe that every right thinking Zambian is with you in this honourable gesture.Thank you for your patriotism sirs. When you make a commet it is advisable to argue inttelligently with facts not insulting.That is an exhibition of ignorance(ubututu) and intolerance.To every view there are many ways of understanding or expression which is not neccessarily wrong.So argue like adults knowing that in a democracy people are always gona be different and they dont need to be insulted. Argue constructively why you disagree. Instead of you thief! !i want to know what did sakala steal and how has this got to do with the case at hand.You ‘idiot’how is he an idiot?is it by expressing his rights of expression to the united nation? Grow up and stop being big headed and self important for nothing. Edwin Sakala has never used his brain in a productive style. He always support PF while masquerading as opposition party leader with no single ward on Constituency representative even in his village in Eastern Province. Even his head morphology looks like hastily assembled in a human factory. To be honest President Mulyiokela can attract my vote and not this PF supporter!